One of the central pillars of colonisation was tax. The European powers did not want Africa to be a drain on their treasuries, and they wanted the colonies to pay their own way. They also wanted people to enter into the cash economy. Taxation was a way of driving people into working for money. The competence of a French colonial official might often be measured by how much tax he was able to collect. This could be in the form of a poll tax or a tax on homes. For the ordinary people, especially those who were not earning money through labour or selling goods, taxation was an intolerable burden. Resentment turned to anger in many parts of Africa. The Portuguese were the earliest Europeans to arrive in Sub-Saharan Africa back in the 15th century. But their activities were, like those of other European powers, confined largely to trading. In the late 19th century they attempted to impose some administrative control. In 1902 a tax collection exercise in Bailundo, in the centre of what is now Angola, went badly wrong when local people rebelled violently, attacking tax collectors and traders (both European and African). This was the first time that Africans had rebelled against the Portuguese in Angola. 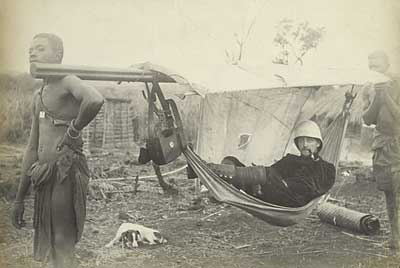 The imposition of a tax on individual property in 1898 was the final straw for Temne and Mende chiefs who had seen a big increase in British intervention in the Protectorate in the 1890's, including: stamping out slavery, seizing any land without title deeds, appointing district commissioners, and increasing levels of policing. The Hut Tax resulted in the death of some British officials and anyone suspected of collaborating. In South West Africa (now Namibia) the Germans played off the Herero against the Nama. But the Herero soon regretted the treaty of protection they had signed with the Germans; they were forced to pay taxes, their land was stolen. 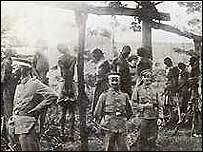 In 1904, frustrated and betrayed, they took the Germans on, destroying some farms and killing a hundred people. The German response was out of all proportion. "The Herero nation must leave the country. If it does not do so I shall compel them by force...Inside German territory every Herero tribesman, armed or unarmed, with or without cattle, will be shot. No women and children will be allowed in the territory: they will be driven back to their people or fired on. These are the last words to the great Herero nation from me, the great General of the mighty German Emperor." - General von Trotha's extermination proclamation quoted by H. Bley's South West Africa under German Rule. The Germans drove the Herero into the Omaheke desert, sealing the last water holes off before erecting a fence to keep them out. Around 50,000 Herero died. With the British abolition of the slave trade in 1807, the British navy took to patrolling the coasts for other nations' slave ships. The motives of the British were not entirely humanitarian. Having given up the commercial benefits of the slave trade, the British were determined to make everyone else do the same. Had they not, their share of African trade would have been much smaller. The anti-slave trading crusade, although inspired by moral righteousness, became a way for Britain to assert itself both commercially and territorially in Africa. However, stopping the slave trade was not easy. On the East coast the British met with considerable resistance from Arab merchants and the Sultan of Zanzibar himself. Meanwhile, in South Africa the Afrikaners were beginning to formulate a way of life not only profoundly religious but also one in which the role assigned to Africans was essentially static and subservient with no vision of change or movement. "...the Queen does not want to take your country or your markets, but at the same time she is anxious that no other nations should take them. She undertakes to extend her gracious power and protection, which will leave your country still under your government: she has no wish to disturb your rule." - Letter 8th January 1884, quoted by Michael Crowder in The Story of Nigeria.